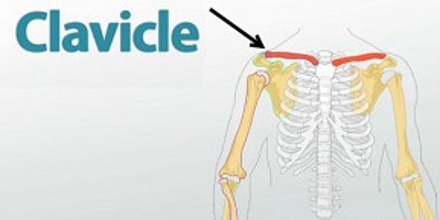 Clavicle is the only long horizontal bone in the body, it is also called collarbone. The shoulder is the most mobile joint in the human body; however, the extreme range of its potential movements makes the shoulder joint susceptible to dislocation. The name clavicle comes from the Latin word for “little key” and describes the shape of the clavicle as an old-fashioned skeleton key. 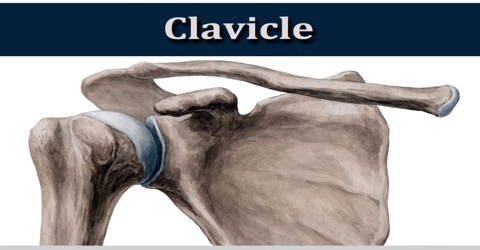 The clavicle is one of the most commonly broken bones in the human body. It also serves as an important and easily located bony landmark due to its superficial location and projection from the trunk. It articulates medially with the sternum and laterally with the acromion of the scapula and accommodates the attachment of numerous muscles. It is shorter, thinner, less curved, and smoother in the female than in the male and is thicker, more curved, and more prominently ridged for muscle attachment in persons performing consistent strenuous manual labor. There are two clavicles, one on the left and one on the right. The clavicle is the only long bone in the body that lies horizontally. 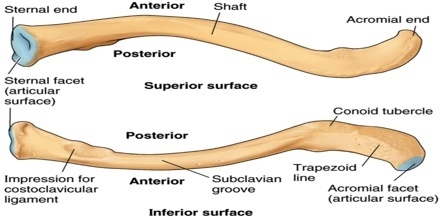 Together with the shoulder blade it makes up the shoulder girdle. The collarbone is long, thin, and located at the base of the neck. It is a long bone, curved somewhat like the italic letter f, and placed nearly horizontally at the upper and anterior part of the thorax, immediately above the first rib. It articulates medially with the manubrium sterni, and laterally with the acromion of the scapula. It presents a double curvature, the convexity being directed forward at the sternal end, and the concavity at the scapular end. Its lateral third is flattened from above downward, while its medial two-thirds are of a rounded or prismatic form. The medial end is quadrangular and articulates with the clavicular notch of the manubrium of the sternum to form the sternoclavicular joint. The articular surface extends to the inferior aspect for attachment with the first costal cartilage. The anterior border is concave, thin, and rough, and gives attachment to the Deltoideus. The posterior border is convex, rough, thicker than the anterior, and gives attachment to the Trapezius. The clavicles function as struts to anchor the arms to the trunk while permitting the movement of the scapulae and shoulder joints relative to the trunk. The movement of the clavicles increases the mobility of the shoulder joints beyond what would be possible with only ball-and-socket joints, allowing the arm to move in a large circle. Several muscles of the neck and shoulder also attach to the clavicle, including the pectoralis major, sternocleidomastoid, trapezius, and deltoid. It serves as a rigid support from which the scapula and free limb suspended; an arrangement that keeps the upper limb away from the thorax so that the arm has maximum range of movement. Reference: innerbody.com, healthline.com, thefreedictionary.com, wikipedia.